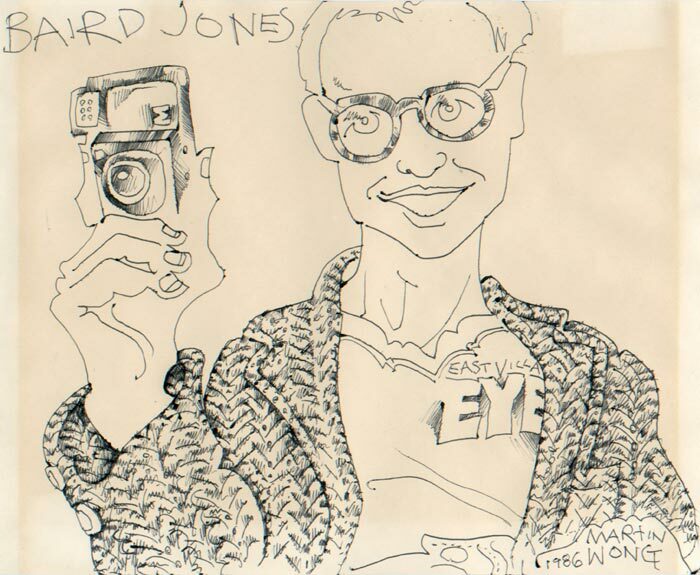 A portrait of Baird Jones by renowned artist Martin Wong, 1986. Baird wears an East Village Eye t-shirt under a coat whose repetitive stitching recalls Wong’s obsessive paintings of Lower East Side bricks and rubble. Baird’s book Sexual Humor mixed high and low by applying Freudian theory to jokes and cartoons like the above. Gallery 98’s extensive new online exhibition resurrects the anomalous Baird Jones: the curator, club party promoter, photographer, author, and celebrity gossip who personified the free-wheeling, polymorphous spirit of fin-de-siècle downtown New York. When Baird died, in 2008, the New York Times ran the headline “Man Departs a Life Lived on the Fringes of Fame.” But Baird’s life was much more than that. This exhibition exposes an over-the-top conceptual force, whose oeuvre of witty actions reflected a time and place (the 1980s East Village) where art, commerce, fun, provocation, and self-serving intellectualization were all inextricably entangled. When Baird migrated his “celebrity art” exhibitions (featuring the likes of Miles Davis, Charles Manson, and Leni Riefenstahl) from Manhattan nightclubs to a network of under-funded, under-attended museums, he carried the post-pop confusion of “high” and “low” to new extremes, pointing the way to today’s starstruck art world. Baird’s reputation lives on through the coveted party invitations that he issued in a continual stream for a quarter century. These enticing descriptions of offbeat entertainments, typeset in plain text on colored paper, now read like a printed-out Twitter feed, documents of his creative mind. Detail from the invitation to Baird’s April 12, 1989 “dwarf tossing” party at the Surf Club. Detail from the invitation to Baird’s April 20, 1996 party and exhibition at Save the Robots. You can view the complete exhibition online at Gallery 98.